Counting down 4 days to the premier of the third season of China Rush...I'm so excited!! =D After 5 months of 'Amazing Wait', I can finally share some of our pre-race photos. Honestly, I've got quite a short-term memory so I've actually kept a log for our entire Amazing Race journey. =P Yes I know I'm a bit obsessed about this but c'mon this was a once-in-a-lifetime experience, of course I wanna try my best to cherish all these memories la! I'm not sure if I've mentioned on my blog before, bro and I had to shorten our Japan trip for 2 days, forfeited our return ticket, and bought another ticket to Shanghai to prepare for this Race. Well...prepare as in getting our driver's license done, shop for race clothes, do the shooting for opening sequence and team intros, do the photoshoot, attend contestant briefing, etc. Sounds like we did a lot of things but apart from all these, we spent most of our time bumming in our window-less hotel (aka the 'redbox') surfing the net and watching TV ...and having 'nightmares' about the Race...lol!! Our 'redbox'!!! I was so bored that I got almost 10 packets of sewing kits from the reception and started sewing my race clothes...lol!! We were so excited when we got our brand new backpacks from production team!! Blue is cool!! =P Put my camera to good use before I surrendered it the day before our race started. 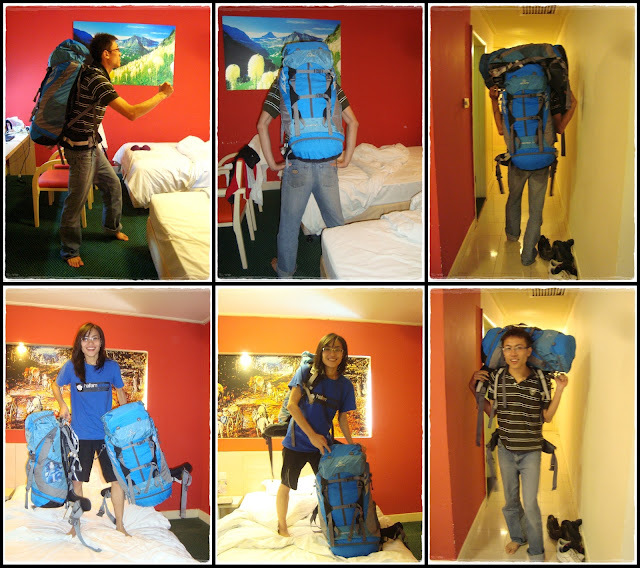 We were so bored and efficient that we packed our bags right away...lol!! Obviously, we were both over-excited with our new 'toys' and was running around our hotel room with our backpacks...haha!! I also taught bro the best way to carry 2 bags just in case I didn't have energy to carry mine...lol!! Definitely a once-in-a-lifetime experience... =) Nice post...keep'em coming! Big shoes or not, it's your turn in the limelight - "AGE QUOD AGIS"
that's from my school motto!